Everyone else is hard at work designing schemas for our new backend, implementing fast pace sync algorithms and finding the best fit for fancy dashboards and reporting. Before you ask, I don’t have anything to show at hand yet. It definitely involves Redis, MySQL and Golang, more on the matter soon. Speaking of OSMC talks, this year brings new possibilities – ignites, short tracks and “full time” talks. Choose what fits best, and share your story on monitoring (challenges) with us in November in Nuremberg 🙂 Not necessarily Icinga related, think of integrations with ticket systems, metrics, plugins, Windows or containers with Kubernetes and Prometheus. The call for papers has been extended until July 31st, 2018. 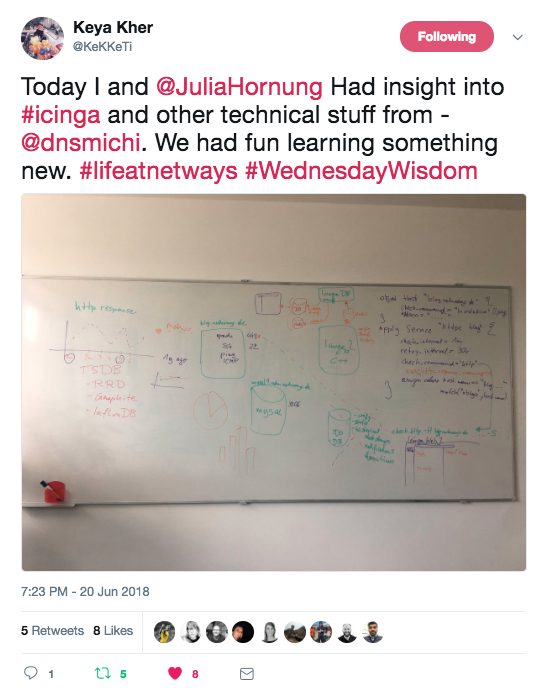 If you haven’t made it to the monthly Icinga meetup in Berlin, Nicolai and Simon have told to be back in July. 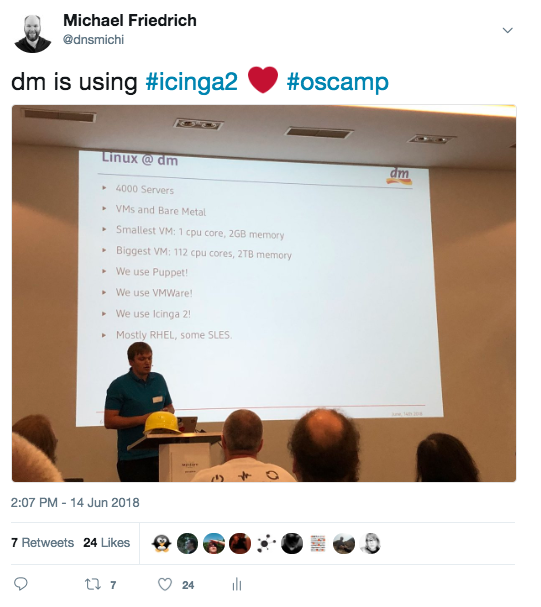 Subscribe to the meetup group updates and ensure to talk Icinga 🙂 Nicolai will also talk about “Visualization of your distributed infrastructure” at OSMC in November. Marianne proposed her talk on OpenHAB Smart Home Monitoring for OSMC too. Věroš jumped into a hot topic, Prometheus for container monitoring and integrate it with Icinga. Join the conversation on Twitter! Marcin shared insights into dynamic host creation with Ansible roles. Dirk released two new plugins on Icinga Exchange, check_tasmota and check_zway2. Daniel shared his solution for monitoring clustered checks with Icinga. Carsten is on the way finishing his Icinga migration, hosted by our partner NETWAYS. Icinga is much easier than I thought. I used to create each host with its services to monitor and added each individually to a hostgroup, but now monitored services are based on hostgroup membership and hostgroup membership is automatic from the specific host template used. New challenge from the community channels: How to find hosts and services which don’t have any notification objects assigned? You cannot really track this with the “object list” command, such an exclusion needs to be done in a programmatic fashion. You can find a solution for the debug console (requires 2.9 unfortunately) and the Pythionic implementation on monitoring-portal.org. Explaining Icinga and the entire integrations stack to someone who’s still learning is hard. Get a board and draw for your life, as I did with my fellow colleagues Julia and Keya at NETWAYS. Obviously the disk was full after explaining what trend prediction means 😉 I hope they’ll soon share their wisdom with you, for now we still have so many things to show, learn and test. Icinga is “just” a piece of many in your modern DevOps stack.